April 8, 2011, 8:15 a.m.
Iowa City, designated by the United Nations as one of the Planet's three "Cities of Literature," is host to arts resources that are broad and deep and go well beyond "literature." Among Iowa City's many quality manifestations of "the arts" is theater -- the University's MFA program, the community's theater venues, the entrepreneurs who keep them open, the actors, directors, producers, and the audiences that support the effort. And, oh yes, the playwrights. And among the playwrights who reside here, or have passed through Iowa City and its University, none is better than our own Janet Schlapkohl, who is, among many other things, the creator and 12-cylinder engine driving Combined Efforts. The author of last summer's "Love At the County Fair," Ms. Schlapkohl has done it again with "triangle," now playing at University Theatre's Theater B, Thursday through Sunday: April 7, 8, 9 (at 8:00 p.m.), and 10 (at 2:00 p.m.). Tickets at the door. ("University Theatre" is what's known to Iowa City's old timers as "Mabie," down by the River.) Eric Hawkinson, "UI presents play on Triangle Shirtwaist fire," The Daily Iowan, April 7, 2011, p. A2. The play is well written, acted, and directed, and very much worth attending just as entertainment and high class theater. The story is told from three perspectives: the young immigrant women, a group of Vassar students, and a woman of color -- eight women actors playing 18 roles. This is unique but what adds to the mix is the bonds of friendship that develop both within and between the individuals and groups. But it is so much more; something every Iowan can learn from -- especially those not old enough to have lived through 20th Century history. Photo credit: Cornell University (see link, below). "triangle," as you may have guessed, is shorthand for the "Triangle Shirtwaist Factory" and the fire of March 25, 1911, 100 years ago this year, in which 146 workers died, most of whom were young immigrant women in their teens and twenties. The workers' efforts to unionize having been beaten back, management, among its many other oppressive practices, kept the doors locked. Because the factory was on the eighth, ninth and tenth floors of a Manhattan building, the workers were some three stories above the highest ladders available to the New York fire fighters. Confronting the prospect of being cremated alive, many chose to leap to their death. 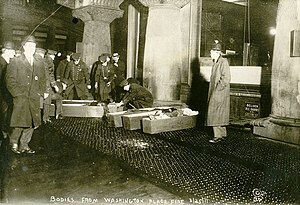 Photo credit: Wikipedia; "Bodies of the victims being placed in coffins on the sidewalk." If you are unfamiliar with the details, there are many sources, including Cornell University's "Remembering the Triangle Factory Fire; 1911 -- 100 Years Later -- 2011," and Wikipedia's "Triangle Shirtwaist Factory Fire." When the "company's owners, Max Blanck and Isaac Harris, were indicted on charges of first and second degree manslaughter . 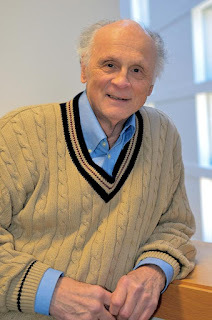 . . Max Steuer, counsel for the defendants, managed to destroy the credibility of one of the survivors, Kate Alterman, by asking her to repeat her testimony a number of times [and then] argued to the jury that Alterman . . . had memorized [her] statements, and might even have been told what to say by the prosecutors. . . . [T]he two men . . . lost a subsequent civil suit in 1913 in which plaintiffs won compensation in the amount of $75 per deceased victim. The insurance company paid Blanck and Harris about $60,000 more than the reported losses, or about $400 per casualty. 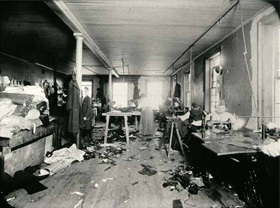 In 1913, Blanck was once again arrested for locking the door in his factory during working hours. He was fined $20." Ibid. Sports Law necessarily includes some references to labor law (indeed, it plays a role in the current conflict between the NFL owners and players). As I was teaching the course this semester, it became obvious to me that the students, most of whom were born in the late 1980s and '90s, knew little of our country's labor history. A show of hands make clear that virtually none of them had ever either belonged to unions or had parents who did. And what they did know, through no fault of their own, had probably been disproportionately shaped by the rhetoric and politics of the last three decades, designed to disparage the value of unions and curtail workers' abilities to organize and enjoy their benefits. We couldn't spend a lot of time on labor history in a Sports Law class, but we spent enough to give them some sense of the relationship between the union movement and the creation of the middle class, with laws regarding minimum wages, maximum hours, child labor, and workplace safety -- with the story of the Triangle Shirtwaist Factory fire playing a significant role in the latter. Sadly, the problems remain. Having essentially decimated unions in the private sector, corporate and government munitions are now aimed at the members of public sector workers' unions. This is not helping Iowa, Iowans, and our economy; it is hurting all of the above. That's why it is incumbent upon all of us to understand more about the union movement and why it is important to our current efforts at economic recovery today, and continued economic growth tomorrow. It's important for our students and future generations to understand. But it can't be grasped from hard copy books and professorial lectures alone. It has to be felt to be understood. "triangle" can help us achieve that understanding. Workplace safety has improved in some ways in the years since the Triangle Shirtwaist Factory fire. But the unavoidable conflict remains for the corporate managers in a capitalist economy: every dollar spent on worker safety is a dollar no longer available for executive bonuses or shareholders' dividends. During the last year we've seen the results in lost lives on BP's offshore drilling rig, and in the depths of Massey's coal mines, among thousands of other workplace deaths. On Wednesday, Tom Fosdick died from injuries sustained Monday, when he fell while replacing Boyd Law Building windows. On Tuesday, President Obama reported to the American people that we are, at last, out of Iraq -- albeit leaving 50,000 troops, uncounted mercenaries and contract employees. In the course of his speech, he paid honor to the "over 4,400 Americans who have given their lives in Iraq." It is appropriate that he do so. Those who put their lives at risk in the streets and sands of Iraq, and made the ultimate sacrifice, certainly are entitled to our respect and honor. But there are another "over 4,000" American workers who also have made the ultimate sacrifice in service to their country. They, too, are entitled to our respect and honor. Fosdick has joined their number. In 2006, there were 5,865 workplace deaths. In 2009, there were 4,340. Apparently a benefit from millions of unemployed is that if they don't have a workplace they're much less likely to be killed in one. Even one year's 4,340 dead workers is the rough equivalent of seven years' dead in Iraq. And 5,865 is more than twice the 2,752 killed on Sept. 11. Moreover, add in the number of workplace non-fatal injuries and diseases and the number in 2008 was more like 3.7 million. These are the men and women who build and maintain what our military is defending, and the rest of us take for granted. They are the ones who have done the sometimes literally backbreaking work, who risk injury, disease and death on a daily basis. They built the high-rise office buildings and condos, the highways and bridges, hospitals and schools, the networks of power lines and natural gas pipelines. Three of them died building our Hancher Auditorium. Now another has died refurbishing our law school. Their ancestors built the canals and railroads that spanned our continent. They now maintain those railroads and subways. They sweat in 100-degree heat in the foundries that produce our tractors. They construct the wind farms, cell phone towers, and radio and TV towers (and then have to climb them to change the little red light bulb on top) -- including the 11 workers who constructed the 2,063-foot antenna tower in North Dakota for KVLY-TV. Fortunately, none of those 11 died. The 11 on the BP offshore oil rig did. And so did the 29 coal miners working in an unsafe Massey mine a couple weeks earlier. We've yet to hear the fate of the 13 in last week's Gulf offshore oil rig explosion. I find it hard to understand those in business and legislatures who sacrifice workplace safety for profits, do everything in their power to beat down unions, OSHA funding, project labor agreements, the right to a livable wage or even an increase in the minimum wage. How can they be mystified as to why Iowa's young folks leave the state for jobs in Minnesota, Wisconsin and Illinois? As someone who spends his days doing finger exercises on computer keyboards, I am in awe of what these men and women are able to do, and are willing to risk in the process. I stop to speak with them when I go into the law building. But we don't introduce ourselves and certainly don't exchange business cards. So while I've met and visited with Fosdick's mother and brother, I don't know if Fosdick was ever among the workers with whom I visited, though I like to believe he was. For me, the memory of Fosdick, the gift of his organs to others, will be something like the tomb of the unknown soldier at Arlington. Someone for whom I grieve, who symbolizes the others we will never know but should remember to recognize and honor every day.
. . . So how can we more effectively promote economic growth? By providing the things that really do attract businesses -- as . . . a Genencor executive [stated as] reasons for coming to Cedar Rapids, "because of its geographic location in the center of the country and its proximity to the fuel ethanol and corn sweetener manufacturing sector." The Register editorializes this morning, Editorial, "Make Quality of Life Iowa's Edge," Des Moines Register, Des Moines Register, January 27, 2008, p. OP1. Certainly, that's a valid suggestion. But much of quality of life, and the things that attracted Genencor, are attractions of geography over which we do not have total control. A far more universal attraction is the well educated workforce that is dependent on things which we can control. Iowa has well educated community college and university graduates. Unfortunately, because they leave the state after receiving that education, they don't constitute a workforce and therefore aren't much of an attraction for business. Kyle Carson, "Young Iowans Do the Math on Salaries -- and Leave; Commission Urges Higher-Ed Tax Credit and Help With Repaying Student Loans," Des Moines Register, January 27, 2008, p. OP1; "Commission Members Weigh In On Worker Shortage," Des Moines Register, January 27, 2008, p. OP6. For a lawyer, Kyle Carson cuts to the core of the answer with an unusual economy of words: "So what should Iowa do? Pay them more." The report said about 13 percent of people in the study area work in industries with entry-level wages of less than $15,000 annually, and another 40 percent work in industries with entry-level wages between $15,000 and $20,000. Almost 30 percent of all households in the study area have incomes less than $25,000. The analysis determined that to afford a median-priced home in the area -- $162,000 -- a household income would have to earn about $53,150 and and not have much additional debt. The study said only 389 units were sold in 2006 that were valued at $100,000 or less, equaling about 15 percent of the total transactions that year. Kathryn Fiegen, "Study warns of housing shortfall; Area prices outpacing incomes," Iowa City Press-Citizen, January 24, 2008. (The study, prepared by Mullin & Lonergan Associates, Pittsburgh, was described by Fiegen as a "127-page, data-intense report.) That report was the basis for a meeting reported in the paper on Saturday: Rob Daniel, "Summit: Housing policy needed; Lack of affordable housing reaching all area sectors," Iowa City Press-Citizen, January 26, 2008, p. A3. And how can Iowa "pay them more"? When was the last time you heard a boss say, "I'm feeling guilty about exploiting you guys with these low wages, seeing your kids go hungry, and without health care or new shoes, so starting next Monday everybody gets a 50% wage hike." It's not likely to happen. A single person, out of work and desperately needing a job, is not in a very strong bargaining position when confronting a potential employer in front of him -- with 700 people standing in line behind that job applicant, all equally anxious to win one of five new job positions. That's why they invented unions and "collective bargaining." "For the union makes us strong," is the old union song lyric; at least strong enough to get something more than the minimum wage for long hours at backbreaking work in unsafe working conditions. Without unions professionals wages are driven down to those of skilled trades people; wages for skilled tradespeople that should be at union levels are driven down to those of unskilled labor; unskilled labor get paid what the working poor earn elsewhere -- and those in every pay category leave Iowa. That being the case, I find it remarkable that neither Kyle Carson nor any other member of the Commission -- nor for that matter the Governor, members of the legislature, media, education leaders -- seem willing to mention, even as an "option," the possibility of Iowa becoming a little more labor union friendly. Nowhere in today's stories does the word "union" even appear. In researching an op ed four years ago I discovered that Iowa was then 43rd of the 50 U.S. states in wages; that our State's anti-union "right to work" laws put us in a minority of states that included the solid South: Texas, Louisiana, Mississippi, Alabama, Georgia, Florida, North and South Carolina; that from 1950 until now, anti-union bashing has driven union membership nationally from 35 percent to 13 percent of the workforce, and even less in Iowa. With corporate campaign contributions going to Democrats and Republicans alike, the disparity between the income of CEOs and hourly workers has gone from 42:1 in 1980 to 531:1 in 2000. Two million workers recently fired for the sake of profits and executive bonuses don’t even have that. The Occupational Safety and Health Administration reports 70 percent of its investigations involve things management knew, or ought to have known, would cause serious injury or death. Nearly 6000 workers a year are killed, more than 5 million injured. Even the most minimal efforts to help the working class and working poor are successfully resisted by Iowa businesses and their legislative representatives, most recently the "fair share" proposal (that those who get the benefits of union negotiations, while refusing to join the union, should at least pay their "fair share" of the costs for those union activities from which they personally enjoy increased wages and benefits). I could not get our local school board to support a "project labor agreement" for its new school construction projects. Nicholas Johnson, "Make School Projects Labor-Friendly," Iowa City Press-Citizen, May 15, 2003, p. A11 (with an appended list of sources). And see State29, "Viva La Slave Labor, Child Labor," January 26, 2008. Union membership rates were down in Iowa and 29 other states in 2007, according to a recent report by the U.S. Bureau of Labor and Statistics. [U]nion membership in Iowa is below the national average for a second-consecutive year. Jennifer Sherer, a labor educator at the UI Labor Center, said . . .
"We're losing higher-paying jobs and gaining lower-paying jobs," . . ..
Sherer also attributed the low rates to employers who make it difficult for new unions to form by using threats and intimidation. The law protecting unionization has not been strongly enforced, she said. "We need political changes to make it possible for people [to form new unions]," she said. Ben Travers, "Union Membership Going Down in Iowa; Despite a Report Indicating That Union Membership is Up Across the Nation, the Percentage of Iowan Union Workers Continues to Drop," The Daily Iowan, January 30, 2008, p. A3. Of course, Iowans and their governments have the political right to continue our anti-labor traditions and reputation. It's just that it's a little self-defeating and hypocritical to continue to do so while simultaneously complaining about the disappearance of the workforce needed to attract the businesses we think we need to promote genuine economic growth. Full disclosure: Although I have no personal financial or other involvement in this script or production, my wife, Mary Vasey, is on the board of Combined Efforts, our son was one of two directors of this play, and Mary and I did have roles in Ms. Schlapkohl's production of "Love at the County Fair." Brother, Can You Spare a TIF?